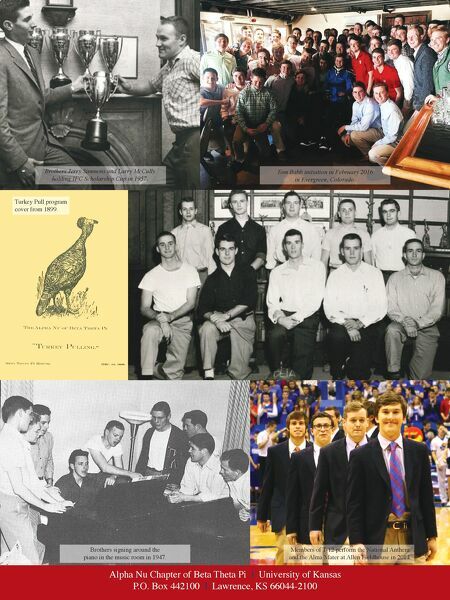 Alpha Nu Chapter of Beta Theta Pi I University of Kansas P.O. Box 442100 I Lawrence, KS 66044-2100 Members of T-12 perform the National Anthem and the Alma Mater at Allen Fieldhouse in 2014. Brothers Jerry Simmons and Larry McCully holding IFC Scholarship Cup in 1957. Tom Babb initiation in February 2016 in Evergreen, Colorado. Turkey Pull program cover from 1899. Brothers signing around the piano in the music room in 1947.